The Bavaria 36 is a great a solid cruising boat with performance. Despite being called a 36, the yacht is actually more than 37’ long. 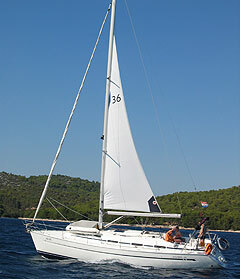 The boat is easily sailed by a crew of one or two and delivers excellent performance under all points of sail. She also point wel, sailing within 75 of true. Unheard of in anything other than high performance racing yachts. The Bavaria 36 yacht is a versatile boat with a choice of 2 or 3 cabin accommodation. Both cabins offer good sized berths which are quite comfortable for two adults and allow generous storage space. The interior is high quality and finished with mahogany joinery. The main saloon provides a dinette with seating for 6 and a spacious galley opposite. The Bavaria is a quality boat and popular with charter companies.